Zinc Oxide offers sun protection as well as medium coverage. Zinc also helps reduce redness and calm irritated skin, often found in Calamine Lotion and Itch Creams. Mica gives a soft + satin finish. This is not the mica that makes your highlight glow, but a special satin mica that offers a more skin-like finish. I offer samples of all colors for you to test out. The sample is made for color and allergy testing and is enough for 1-2 applications. Colors are very forgiving, go more for your "shade" than your "tone", if you have yellow or olive skin, try Almond first, but also get one shade lighter and one shade darker to test, so you can find the right blend. Sometimes I blend Palomino and Almond to get my perfect color, but in the summer, I use just Almond and a little less Palomino. I like that I can adjust my color by mixing, without having to worry about the formula doing anything crazy. I use Baked or San Tropez as a bronzer that also offers coverage. Your skin should be clean + moisturized before applying mineral makeup, and ideally you would apply your facial oil or moisturizer and then give it 5-10 minutes to soak in. Gently blot any excess oil before applying the minerals. Dip brush in jar, tap off excess, buff in circular motions into clean + moisturized skin. If you have dry skin, exfoliate before use and apply a facial oil. This is not meant to me super matte, I like to mist with PRIME + SET MIST after I apply to blurr and blend. A flat-topped brush or buki brush is the best to get full coverage. For making a foundation serum, mix a small amount of foundation powder in your hand or a small dish with 3-5 drops of serum or face oil. Apply using fingers. For more coverage, follow with a dusting of powder. I get a lot of questions about switching from a liquid foundation to mineral foundation. One of the biggest reasons why mineral makeup is so beneficial vs commercial foundation is that it doesn't contain all of the fillers and emulsifiers. These are the ingredients that many times clog pores or irritate skin. A foundation can be "oil-free and non-comedogenic" and still contain hormone disruptors, parabens, chemical preservative, and irritants. This allows you to customize the powder for exactly what your skin needs. In winter, you can mix this with your favorite rich cream, so you get coverage and moisture, and in the summer, you can just lightly buff over your Sun Block. Always apply to exfoliated and moisturized skin. If you use primer, apply primer after moisturizer and let soak in for a few minutes before applying your foundation. Moisturizer is really THE key to applying any makeup, but mineral makeup especially. 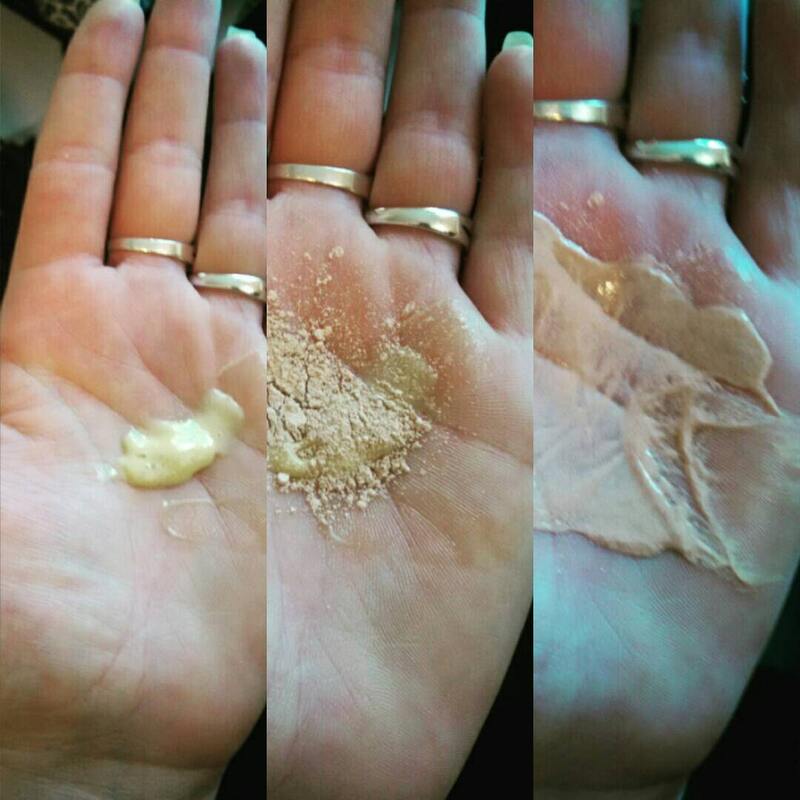 Dry skin tends to "eat" makeup or over-produce oil, making your makeup breakup and run. If you want more coverage, rather than using a lot of powder on your brush, buff a small amount into your whole face first to even tone. Next, buff more foundation into areas where you need more coverage. To make your own BB cream simply mix a small amount of powder in you hands with a bit of moisturizer. For more coverage, buff foundation powder on top after moisturizer has soaked in. You can mix colors together to make your perfect shade. If you aren't quite Almond, but Casper is too fair, mix the two together. If you aren't sure what color, grab the sampler set, which includes all six shades for testing. MOCHA - Rich cocoa-coffee brown with a slight rosy underdone and yellow base. COFFEE - Rich deep black coffee brown. No red, just a touch of yellow. ***Custom colors are also available. If you just can't find your shade, message me and I can do a custom consult.